Donors have the ability to opt out of sharing personal information, whether that information has been submitted online or offline. Upon the request of a donor, The Marine Mammal Center will not trade, share or sell that donor’s personal information with anyone else. Their name and mailing address will be removed from mailing lists that are shared with other charitable organizations. The following discloses our information gathering and dissemination practices for the websites located at the URL tmmc.marinemammalcenter.org and all affiliated websites, or information collected at events, or onsite at The Marine Mammal Center. How the user can correct any inaccuracies in the user information. We do not store sensitive information from our visitors, such as credit card details or social security numbers in our files at The Marine Mammal Center. Monthly donor credit card information is stored externally through a highly encrypted system. We do not share email addresses outside the organization. We reserve the right to send an email on behalf of another like-minded organization with which we are partners, but under no circumstances will the user's email be revealed to that organization unless the user opts-in to receive that organization's emails. We collect an IP address from all visitors to our site/s. An IP address is a number that is automatically assigned to the user's computer when the user uses the Internet. We use IP addresses to help diagnose problems with our server, administer our site, analyze trends, track users' movement, gather broad demographic information for aggregate use in order for us to improve our site/s, and deliver customized, personalized content. IP addresses are not linked to personally identifiable information. All information involving monetary transactions provided to The Marine Mammal Center is transmitted using SSL (Secure Socket Layer) encryption, such as donation forms, e-commerce, and event registrations. SSL is a proven coding system that lets the user's browser automatically encrypt, or scramble, data before the user sends it to us. We also protect account information by placing it on a secure portion of our site that is only accessible by certain qualified employees of The Marine Mammal Center. Unfortunately, however, no data transmission over the Internet is 100% secure. While we strive to protect the user's information, we cannot ensure or warrant the security of such information. 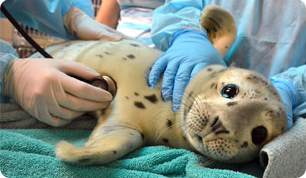 When a user opts-in to receive email from The Marine Mammal Center via any method, the user will automatically start receiving regular email updates from The Marine Mammal Center. The user has full control of their email account and the types of emails they subscribe to. The user can change their account and subscription settings at any time via logging in to their profile page which can be found via a link at the bottom of an email or via the login tab at the top of the website MarineMammalCenter.org, and clicking on "Special Interests" then checking or unchecking the types of emails they want to receive. The Marine Mammal Center does not share email addresses outside of the organization and never sells user's email addresses. It is our policy to not send solicitation emails to individuals under the age of 18 (based on our ability to possess knowledge of the user's age). If a user elects to use our free referral service for informing a friend about our website, we ask him or her for the friend's name and email address. The Marine Mammal Center will automatically send the friend a one-time email inviting he or she to visit The Marine Mammal Center's website. The Marine Mammal Center uses this information for the sole purpose of sending this one-time email and does not automatically opt them in to any email list. Our site contains links to other websites. Please note that when the user clicks on one of these links, the user is entering another website for which The Marine Mammal Center has no responsibility. We encourage the user to read the privacy statements on all such sites as their policies may be different than ours.